In neonates, where transplacental maternal estrogens are still circulating. This form uniformly resolves. In adult life, due to the aromatase driven conversion of testosterone to estrogen in peripheral fat. 60% of it occurs in septuagenarians and this form of gynecomastia does not resolve. Disorders of the endocrine system leading to an increase of the estrogen to testosterone ratio can cause Gynecomastia. Systemic causes related to the development of gynecomastia need to be excluded. These include: Liver disease such as hepatitis or cirrhosis, Lung carcinoma, Decreased testosterone levels can occur in patients with carcinoma or malfunction of the testes, Certain adrenal tumors produce androstenedione, which is converted into a form of estrogen by the enzyme aromatase, Pituitary tumors can also lead to diminished pro- duction of testosterone, Carcinoma of the colon or prostate, Thyroid disease, Testosterone imbalance, Congenital syndromes such as Klinefelter syndrome, Familial and idiopathic causes, Debilitating diseases, such as severe burns. Moreover, various medications or drugs can cause the development of Gynecomastia. Those include Marijuana, alcohol, spironolactone, digoxin, cimetidine, diazepam, reserpine, anabolic steroids, estrogens and theophylline. 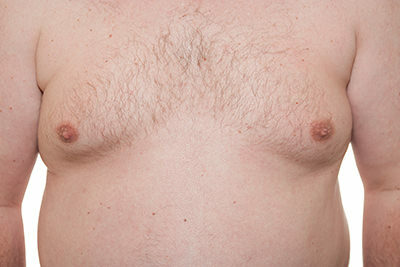 Depending on the etiology, the treatment of Gynecomastia can vary. For neonates and adolescents, watchful waiting is recommended. If an etiology is identified (such as drugs or disorder), a reversal of the etiology (stopping drugs or treating the underlying disorder) is the treatment of choice. Improving the patient diet is recommended. Finally, in some instances, pharmacotherapy (testosterone, tamoxifen, danzanol) can be helpful in the treatment of Gynecomastia. With regards to the surgical treatment, depending on the severity (mild, moderate or severe) and the characteristics (excess skin only, excess skin and gland) the breat enlargement, surgical treatment can include standard liposuction, ultrasound liposuction, subcutaneous mastectomy or mastectomy with skin incisions.